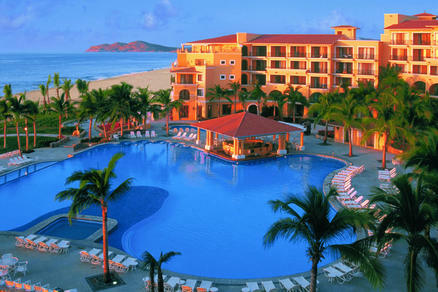 Dreams Los Cabos Suites Golf Resort & Spa, Mexico 5.0 out of 5 based on ratings. 1 user reviews. Dreams Los Cabos Suites Golf Resort Spa is an all-inclusive Los Cabos resort offering 308 guest suites in pale-yellow, 4-5-story buildings. Large, furnished balconies provide views of the Sea of Cortez. Ceiling fans supplement air conditioning. Bathrobes and slippers furnish lounging comfort. Other features include flat-screen TVs, DVD players (complimentary DVD's available), and designer toiletries. Decor includes crown molding, tan marble floors, red marble bathroom vanities, and wrought-iron headboards, chandeliers, and beautiful furniture.